Two time Inter-Continental Champion (IBF & WBO) and former WBO Light Heavyweight World Title Challenger Mark Prince’s opponent, for his much anticipated return to the Championship battleground, when he challenges for the vacant MBC International Cruiserweight title at York Hall in London on August 2nd, was today named as the Czech Republic’s former Light Heavyweight Champion Jiri Svacina. Svacina may be the slightly more experienced of the pair, having fought twenty three times, to Prince’s twenty two, five of which were Championship bouts, but the clear bookies favourite is without doubt London’s Prince. Since returning to the fray, following a fourteen year sabbatical from the sport, in April last year, Prince has racked up two sensational stoppage wins, over Jindrich Velecky (4th round) and more recently Olegs Lopajevs (1st round) to earn this shot at the vacant MBC International Cruiserweight title. However saying that, Svacina should prove to be a much tougher opponent than either Velecky or Lopajevs, having only been stopped twice in his career, the first time by Grzegorz Soszynski, when they fought for the Polish title back in 2008 and more recently by the sensational Interim WBA World Cruiserweight Champion Youri Kayembre Kalenga. On learning who he is set to face, for the vacant MBC International Cruiserweight crown on August 2nd, Prince was quick to give his view on the upcoming clash. “Yeah I’m certainly looking forward to the fight, can’t wait. Don’t know the guy at all, not bothered I take them as they come, I knock them out when I knock them out, you put them in front of me and I’ll take them out. Take the last guy (Olegs Lopajevs), I don’t know why he came at me like that, probably because he knocked out his last four opponents and he was probably gassed, as a lot of people would say, he was probably gassed about what he’d done, with his knock out record, but it wasn’t the right kind of strategy to come out against someone like myself, I’m experienced and relaxed, created some space to see if he could handle my power, he couldn’t, didn’t last the first round. Prince then went on to speak about the Kiyan Prince Foundation – www.kiyan.org - and the increase in awareness of the KPF, which is dedicated to his son Kiyan, a talented QPR youth striker who was tragically murdered in 2006, since he returned to the ring and just what winning the title will mean to him in his endeavours to keep young people from turning to crime, especially knife crime. “The message is definitely getting out there with the charity, now we’re at the point where we can serve the community, by helping young people mentally, emotionally, physically and educate them to turn their back on knife crime. It’s almost like we are extra parents, you know, it’s just another job but caring about young people, that’s what we want to do, we did it for Kiyan and he was a successful young man, and we want to replicate that for the young people on the street, troubled, distressed and don’t know the way forward, they might be involved in gangs and like I did when I was young, think that the only way they can make any money was to sell drugs, get involved in criminal activities, we can turn them around and they can have a great life ahead of them. The higher the level that I go in Boxing, is the higher level of audience I reach, you know that’s my whole incentive for fighting for the title, I want to be able to be a high profile Boxing figure, that isn’t just saying ‘look at me I’m the greatest, I knock out these guys’ NO you put the camera on me and it’s about showing the kids that their mentor is a real role model and that what they need to be focusing on. It’s not the money, it’s not the cars, it’s adorning yourself with the attributes of a Champion, attributes of a successful individual and I believe that you need to share that blueprint with young people and that’s what we should all be focusing on. Me winning this title on August 2nd will have an effect on the young people, it will inspire them, just look at some of the comment forms from the schools we’ve spoken at, it grabs your emotions the way the kids have taken it on board and how they have understood the message we are trying to get across. Give me the platform and I’ll take care of business, let’s win the title and then let’s make it happen. Certainly now more and more people are understanding that boxing isn’t just people knocking seven bells out of each other, there is so much more involved in this great sport, just starting with the simple stuff. Discipline, you need to be organised to be a fighter, you have to set your routine for the day, you have to set a plan and your goal, for what you want to achieve, you have to work hard. Great life skills is what Boxing gives you, young people need this, I often use boxing as an analogy for life. When you’re in the ring in a fight things might not be going your way, in life things aint going to be going your way, what you gonna do about it, throw in the towel straight away, NO fighters don’t do that, at whatever level, they want to fight on they want to push harder, they want to find away to win and that’s what we want to teach these kids, boxing is the perfect sport for this. The drive I have to carry me through each day, to save young people and their parents going through what Kiyan and us went through, is the same that drives me, I don’t just talk the talk, I walk the walk, I couldn’t tell the kids anything that I’m not doing myself, so I’m doing it so they can see how it works out in reality, I want to tell them about it so that they have the understanding from me speaking to them. We’re going to achieve this goal, win this title, so we can get more young people involved as mentors, this isn’t about just helping them it’s about producing more mentors, so young people can educate more young people and that’s how we eradicate knife crime. Because it all comes down to feeling so passionate about this event that they care about their community, thus they end up being the solution not the problem itself. So, support me, I can’t think of a greater reason to come out and watch a fight, I will give you top rated World class skills, speed, power and intelligence in the ring, I will give you passion, I will even give you some humour, the way I go about my job is entertaining, because I’m an entertainer, that’s the business I am in, so I will entertain you while I showcase my skills. 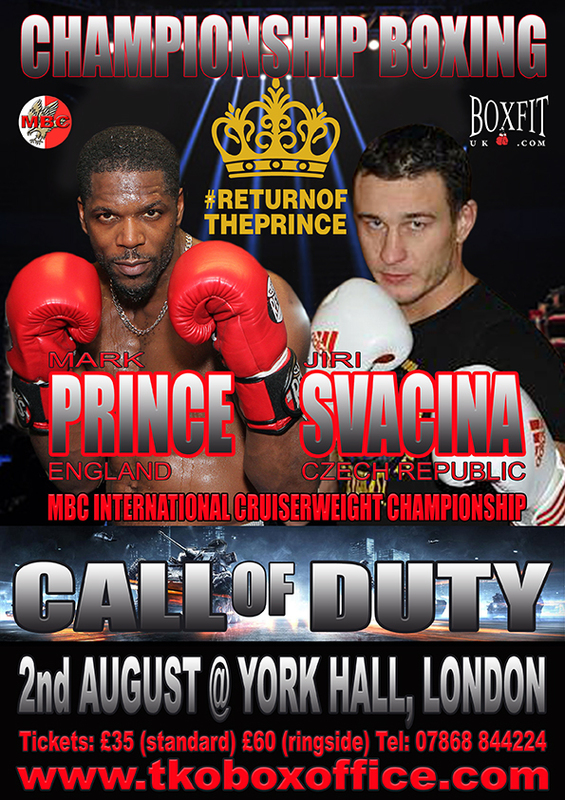 Mark Prince versus Jiri Svacina, for the vacant MBC International Cruiserweight Title, headlines the Shyam Batra SSE Promoted CALL OF DUTY event at York Hall in Bethnal Green, London on Saturday 2nd August 2014.